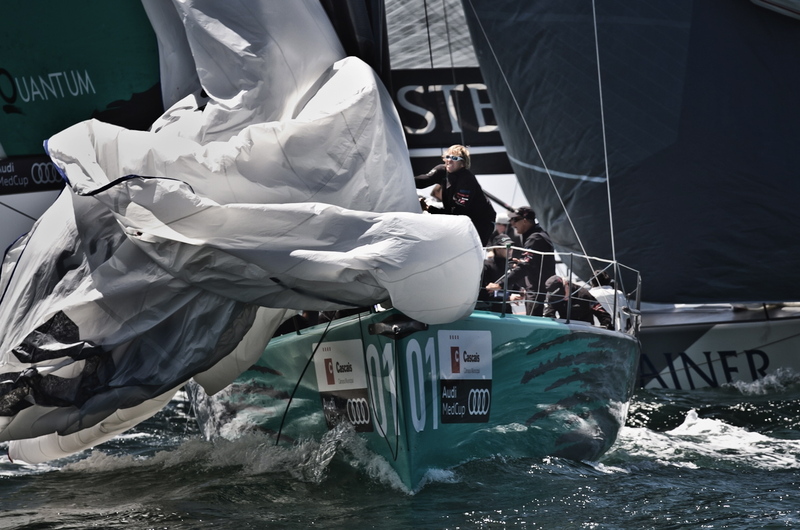 The north, north westerly conditions favoured Ran today who racked up their first win at Audi MedCup by taking out the coastal race. 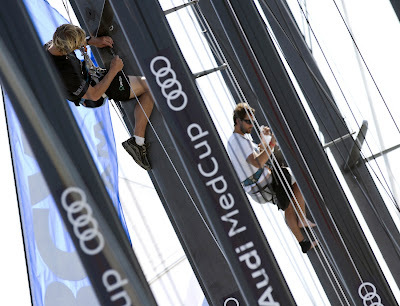 Newcomers to the Audi MedCup Circuit this season, Niklas Zennstrom and his crew sailed clean and mean by managing to increase their separation from Quantum by up to 350 metres at one stage and leading at every mark. Ran have now climbed into fifth position overall thanks to the 1.5 point bounty. 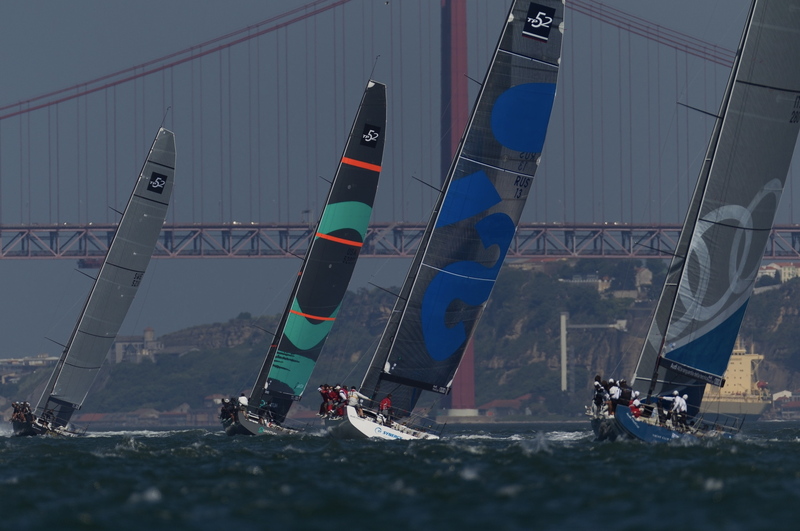 A second place for Quantum Racing means the TP52 world champions enter the final day of the Cascais Trophy with a lead of 5.5 points over Audi Azzurra Sailing Team. The fleet were sent out on a course to Cabo Raso, west of Cascais where winds peaked at 22 knots before heading down the River Tejo towards Lisbon where the breeze dropped to a milder 12 knots but with a strong current. 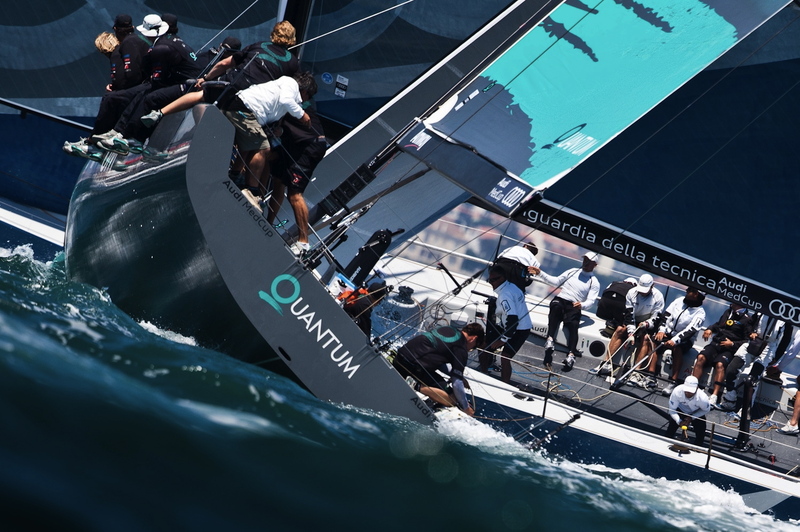 Quantum fought back when the pressure proved to be offshore left of the first short beat. 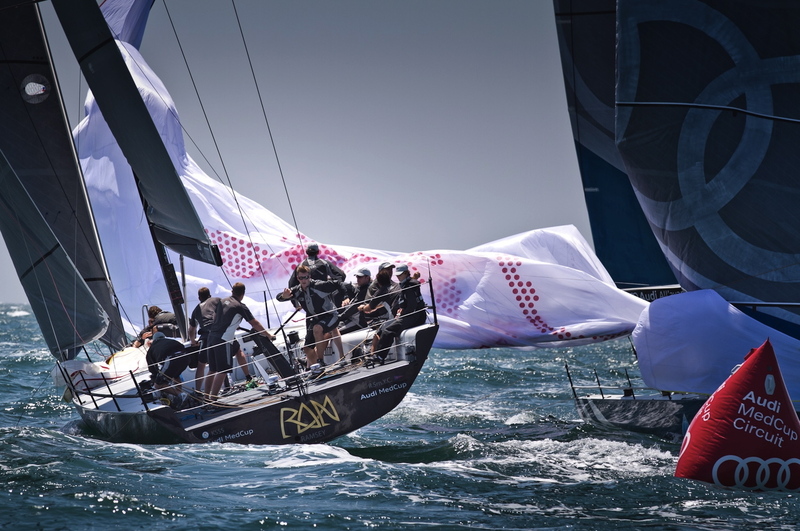 Azzurra fouled Synergy on the long beat to Cabo Raso for not completing their tack in time and copped a penalty causing them to rounded the most westerly turn of the course in last place with a deficit of one minute and 34 seconds. But the Italians managed to bounce back by heading offshore where they pick up some nice waves on the long run back to pass the mid-race mark in fourth, just 16 seconds off third placed Russians. Revenge was sweet when they overhauled the Russians on the penultimate leg. Quantum tried to bounce the Italians right and give Synergy an opening, putting a one boat buffer between themselves and their nearest rivals for the overall lead however Azzurra held their nerve and, as strategist Vasco Vascotto put it later, are ‘still alive’. 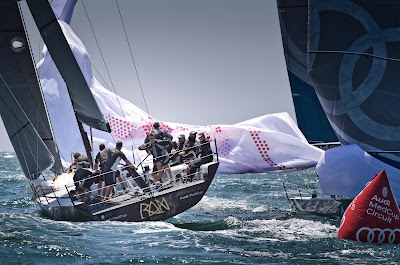 Container blew their preferred heavy air downwind spinnaker from luff to leech and were relegated to today’s second division as a consequence as were Bríbon who also suffered a spinnaker tear. “We handled the boat well and managed to stay away from them. We´ve made so many mistakes this week that it was time for us not to make any, and we almost achieved that goal. It was important to get our first win, it boosts our confidence. Now we can put our first Audi MedCup victory behind and try to get a few more in the future,” said race winner Niklas Zennstrom. ahh that photo explains everything thats why RAN had a protest flag, Quantum drop their kite on them. You can even see the guy jumping for the flag!